Detect OOXML files with undefined behaviour? I just noticed the new Norwegian proposal for archiving rules in the goverment list ECMA-376 / ISO/IEC 29500 (aka OOXML) as valid formats to put in long term storage. Luckily such files will only be accepted based on pre-approval from the National Archive. Allowing OOXML files to be used for long term storage might seem like a good idea as long as we forget that there are plenty of ways for a "valid" OOXML document to have content with no defined interpretation in the standard, which lead to a question and an idea. Is there any tool to detect if a OOXML document depend on such undefined behaviour? It would be useful for the National Archive (and anyone else interested in verifying that a document is well defined) to have such tool available when considering to approve the use of OOXML. I'm aware of the officeotron OOXML validator, but do not know how complete it is nor if it will report use of undefined behaviour. Are there other similar tools available? Please send me an email if you know of any such tool. A few days ago, we received the ruling from my day in court. The case in question is a challenge of the seizure of the DNS domain popcorn-time.no. The ruling simply did not mention most of our arguments, and seemed to take everything ØKOKRIM said at face value, ignoring our demonstration and explanations. But it is hard to tell for sure, as we still have not seen most of the documents in the case and thus were unprepared and unable to contradict several of the claims made in court by the opposition. We are considering an appeal, but it is partly a question of funding, as it is costing us quite a bit to pay for our lawyer. If you want to help, please donate to the NUUG defense fund. The details of the case, as far as we know it, is available in Norwegian from the NUUG blog. This also include the ruling itself. On Wednesday, I spent the entire day in court in Follo Tingrett representing the member association NUUG, alongside the member association EFN and the DNS registrar IMC, challenging the seizure of the DNS name popcorn-time.no. It was interesting to sit in a court of law for the first time in my life. 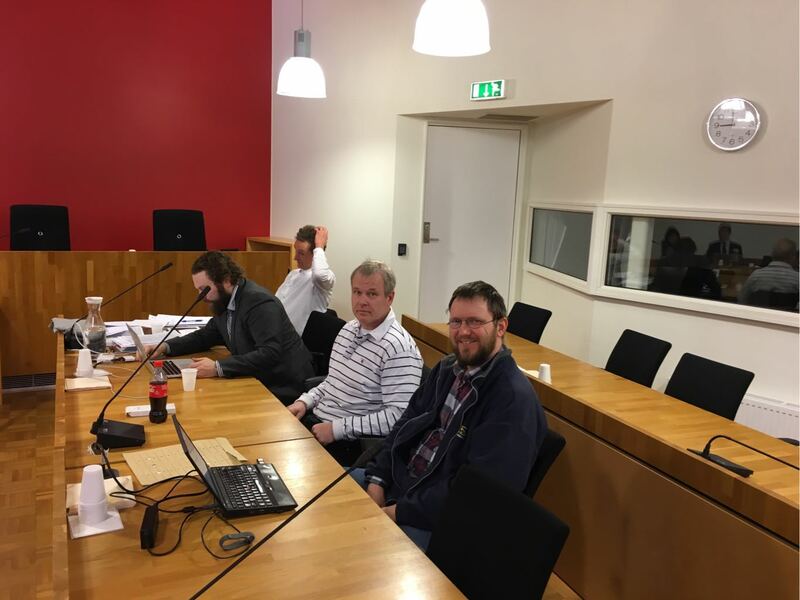 Our team can be seen in the picture above: attorney Ola Tellesbø, EFN board member Tom Fredrik Blenning, IMC CEO Morten Emil Eriksen and NUUG board member Petter Reinholdtsen. The case at hand is that the Norwegian National Authority for Investigation and Prosecution of Economic and Environmental Crime (aka Økokrim) decided on their own, to seize a DNS domain early last year, without following the official policy of the Norwegian DNS authority which require a court decision. The web site in question was a site covering Popcorn Time. And Popcorn Time is the name of a technology with both legal and illegal applications. Popcorn Time is a client combining searching a Bittorrent directory available on the Internet with downloading/distribute content via Bittorrent and playing the downloaded content on screen. It can be used illegally if it is used to distribute content against the will of the right holder, but it can also be used legally to play a lot of content, for example the millions of movies available from the Internet Archive or the collection available from Vodo. We created a video demonstrating legally use of Popcorn Time and played it in Court. It can of course be downloaded using Bittorrent. I did not quite know what to expect from a day in court. The government held on to their version of the story and we held on to ours, and I hope the judge is able to make sense of it all. We will know in two weeks time. Unfortunately I do not have high hopes, as the Government have the upper hand here with more knowledge about the case, better training in handling criminal law and in general higher standing in the courts than fairly unknown DNS registrar and member associations. It is expensive to be right also in Norway. So far the case have cost more than NOK 70 000,-. To help fund the case, NUUG and EFN have asked for donations, and managed to collect around NOK 25 000,- so far. Given the presentation from the Government, I expect the government to appeal if the case go our way. And if the case do not go our way, I hope we have enough funding to appeal. From the other side came two people from Økokrim. On the benches, appearing to be part of the group from the government were two people from the Simonsen Vogt Wiik lawyer office, and three others I am not quite sure who was. Økokrim had proposed to present two witnesses from The Motion Picture Association, but this was rejected because they did not speak Norwegian and it was a bit late to bring in a translator, but perhaps the two from MPA were present anyway. All seven appeared to know each other. Good to see the case is take seriously. If you, like me, believe the courts should be involved before a DNS domain is hijacked by the government, or you believe the Popcorn Time technology have a lot of useful and legal applications, I suggest you too donate to the NUUG defense fund. Both Bitcoin and bank transfer are available. If NUUG get more than we need for the legal action (very unlikely), the rest will be spend promoting free software, open standards and unix-like operating systems in Norway, so no matter what happens the money will be put to good use. If you want to lean more about the case, I recommend you check out the blog posts from NUUG covering the case. They cover the legal arguments on both sides.